› Author Affiliations Funding This work was supported by grants from the FIS-FONDOS FEDER (PI15/01457, N.V.B.). The treatment goal for patients with immune thrombocytopaenia (ITP) is to raise platelet counts to levels that minimize or stop bleeding. 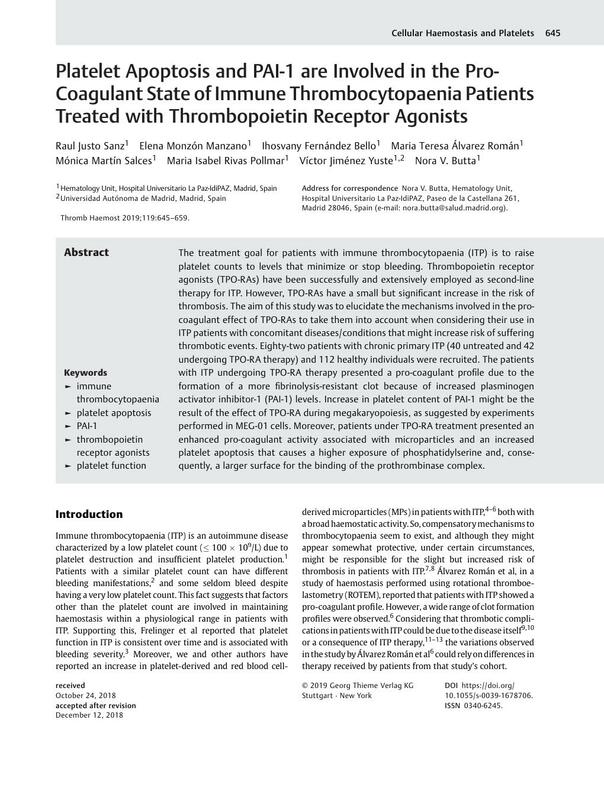 Thrombopoietin receptor agonists (TPO-RAs) have been successfully and extensively employed as second-line therapy for ITP. However, TPO-RAs have a small but significant increase in the risk of thrombosis. The aim of this study was to elucidate the mechanisms involved in the pro-coagulant effect of TPO-RAs to take them into account when considering their use in ITP patients with concomitant diseases/conditions that might increase risk of suffering thrombotic events. Eighty-two patients with chronic primary ITP (40 untreated and 42 undergoing TPO-RA therapy) and 112 healthy individuals were recruited. The patients with ITP undergoing TPO-RA therapy presented a pro-coagulant profile due to the formation of a more fibrinolysis-resistant clot because of increased plasminogen activator inhibitor-1 (PAI-1) levels. Increase in platelet content of PAI-1 might be the result of the effect of TPO-RA during megakaryopoiesis, as suggested by experiments performed in MEG-01 cells. Moreover, patients under TPO-RA treatment presented an enhanced pro-coagulant activity associated with microparticles and an increased platelet apoptosis that causes a higher exposure of phosphatidylserine and, consequently, a larger surface for the binding of the prothrombinase complex. R.J.S., E.M.M. and I.F.B. performed the experiments. M.T.A.R., M.M.S., M.I.R.P. and V.J.-Y. diagnosed, provided clinical care and verified patient information of immune thrombocytopaenia patients. All authors analysed the results. N.V.B. was the principal investigator, designed the experiments and wrote the manuscript. All authors approved the manuscript.